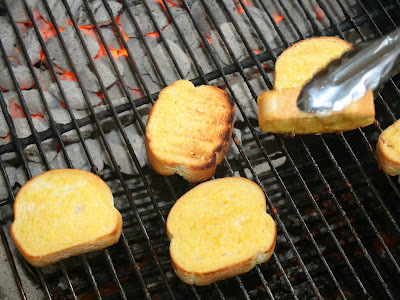 Cole's Garlic Bread on the grill - indirect heat. Chicken brushed with cooking oil before adding barbecue sauce the last 10 minutes. YUM!. Some great eating at our house tonight. After getting the power bill for the month at $189 (and this is a small brack ranch house), we definately grilled tonight. No problem. We love to grill anyway. And, it does help to do the food outdoors instead of heating up the kitchen. We decided to grill chicken tonight and use Carolina Pride Barbecue sauce which is kind of a blast from the past. My family used Carolina Pride when I was growing up. It's been years since I've bought any. In fact, I've not even noticed it on the shelves at the big grocery stores, but the little IGA in town has only a few choices - Carolina Pride BBQ was one of them. Chicken can be kind of tricky on the grill especially if you're cooking large pieces like breasts. The key to getting it done without burning it is to use an indirect heating method. You'll see above in the bread picture how our coals were set up for indirect heat. The lid is then put on for most of the cooking time on the chicken - not for the bread though which cooks in minutes. To keep the chicken from sticking, brush it with a little cooking oil before putting it on the grill. Then add the barbeque sauce during the last few minutes - 5 to 10. Anything tomato based is going to be bad about burning though not as much so with indirect grilling. We still wait and do the sauce near the end. I've mentioned Texas Toast on the grill. This time I tried another brand - Cole's - since it was on sale. It was terrific. I think I like it even better than the Texas Toast brand. Either is great though. We rounded out the meal with cheese potatoes in the crock pot (which doesn't heat the kitchen up) and asparagus in the new Glad Simply Cooking microwave cooking bags - just zip and cook a couple of minutes. Very easy. And another dish that keeps the cool going in the kitchen.